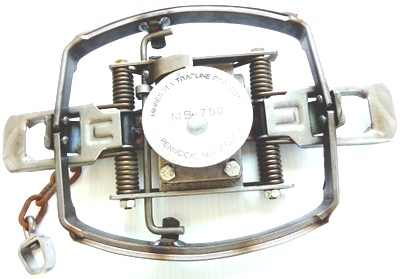 Finally a coilspring trap that will stand up to abuse by either wolf or cougar that you can actually afford to buy. The MB-750 "Wolf" has the same heavy frame and jaws as the MB-750 "Beaver" plus extra heavy music wire springs and a super heavy-duty wolf swivel with welded rivets coming off the D-ring baseplate. Offset jaws with 3/16" thick x 1/2" wide flat lamination strips are standard equipment. As most "Wolfers" prefer to develop their own chain setups, the MB-750 "Wolf" comes with no chain.